Very Simple Markov-Perfect Industry Dynamics: Theory (with Jaap H. Abbring, Nan Yang, and Jan Tilly). Econometrica 86(2), 721-735. March 2018. A supplement establishes the one-shot deviation principle for subgame perfection for a class of dynamic games with payoffs that can be unbounded from below. The article's model belongs to this class. It also applies our analysis to an alternative specification of our model with simultaneous entry and exit. Forward Guidance and Macroeconomic Outcomes Since the Financial Crisis (with Jonas D.M. Fisher, Alejandro Justiniano, and Leonardo Melosi). 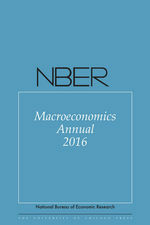 2016 NBER Macroeconomics Annual 283-357. Rigid Prices: Evidence from U.S. Scanner Data (with Benjamin Eden). International Economic Review 55(2), 423-442. May 2014. Macroeconomic Effects of FOMC Forward Guidance (with Charles L. Evans, Jonas D.M. Fisher, and Alejandro Justiniano). Brookings Papers on Economic Activity, Spring 2012, 1-54. Journal of Applied Econometrics26(7), 1113-1136. November-December 2011. Please see the paper's replication file for more information. Last-In First-Out Oligopoly Dynamics (with Jaap H. Abbring). Please see the paper's replication file. A corrigendum corrects a minor error found after the article's publication. A Conversation with 590 Nascent Entrepreneurs (with Mariacristina De Nardi). Annals of Finance 5(3-4), 313-340. June 2009. Market Size Matters (with Hugo Hopenhayn). Real Exchange Rate Fluctuations and the Dynamics of Retail Trade Industries on the U.S.-Canada Border (with Beverly Lapham). American Economic Review, 94(4), 1194-1206. September 2004. Idiosyncratic Risk and Aggregate Employment Dynamics (with Jonas D.M. Fisher). Review of Economic Dynamics, 7(2), 331-353. April 2004. Aggregate Employment Fluctuations with Microeconomic Asymmetries (with Jonas D.M. Fisher). American Economic Review, 90(5) 1323-1345. December 2000. Entry, Exit, Embodied Technology, and Business Cycles. Review of Economic Dynamics, 1(2), 371-408. April 1998. Macroeconomic Effects of Employment Reallocation (with Kenneth N. Kuttner). Carnegie-Rochester Conference Series on Public Policy, 44 87-116. June 1996. How the U.S. Economy Resembles a (very) Big Business. Federal Reserve Bank of Chicago Economic Perspectives, 32(3), 29-46. 2008. This article introduces the reader to national income accounting and its uses in basic business cycle analysis. Consumption-Based Macroeconomic Forecasting (with Spencer D. Krane). Federal Reserve Bank of Chicago Economic Perspectives, 29(4), 52-70. 2005. Creative Destruction in Local Markets (with Jaap H. Abbring). Federal Reserve Bank of Chicago Economic Perspectives, 28(2), 50-60. 2004. Understanding Aggregate Job Flows (with Jonas D.M. Fisher). Federal Reserve Bank of Chicago Economic Perspectives, 21(5), 19-37. 1997. Long-Run Labor Market Dynamics and Short-Run Inflation (with Ellen R. Rissman). Federal Reserve Bank of Chicago Economic Perspectives, 18(2), 15-27. 1994. Comment on “The Role of Retail Chains: National, Regional and Industry Results”, by Ronald S. Jarmin, Shawn D. Klimek, and Javier Miranda. in Producer Dynamics: New Evidence from Micro Data edited by Timothy Dunne, J. Brandford Jensen, and Mark J. Roberts. 2009. Comment on Measuring and Analyzing Aggregate Fluctuations: The Importance of Building from Microeconomic Evidence by John C. Haltiwanger. in The Federal Reserve Bank of St. Louis Review 79(3), 83-86. May/June 1997. Median Unbiasedness of Estimators of Panel Data Censored Regression Models (with Bo E. Honoré). Econometric Theory, 9(3), 499-503. June 1993. Last modified by JRC on April 5, 2018.